As the city population grew, the walls were extended to enclose the homes and buildings that were built outside the city wall. In 586 BC, because of their idolatry, Jerusalem fell to Nebuchadnezzar, king of Babylon, and its inhabitants were exiled to slavery in Babylon. The temple was destroyed, but rebuilt 70 years later by decree of Cyrus the Persian. Unlike the northern kingdom of Israel, the southern kingdom of Judah that had been exiled to Babylon was allowed to return to their homeland. (2 Chron 36:23). 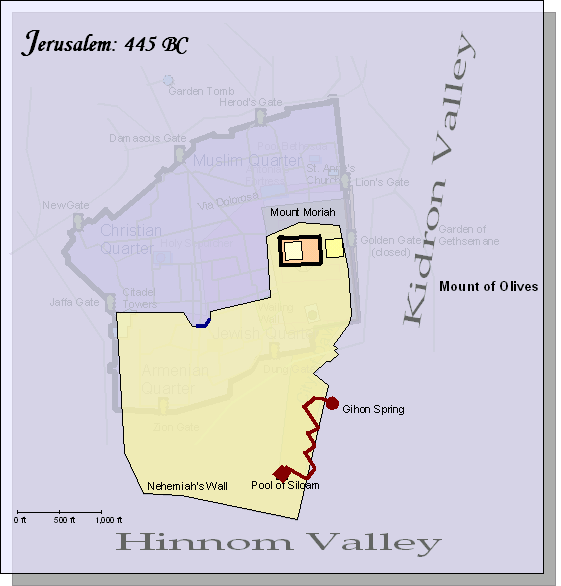 This map depicts the wall of Jerusalem that Nehemiah rebuilt in 445 BC. Despite fierce opposition, he completed the wall in 53 days. The small section of the wall colored in blue still stands today. It can be seen on the Jerusalem page.